To Cite: Siyadatpanah A, Tabatabaei F, Emami Zeydi A, Spotin A, Fallah-Omrani V, et al. Parasitic Contamination of Raw Vegetables in Amol, North of Iran, Arch Clin Infect Dis. 2013 ; 8(2):e15983. doi: 10.5812/archcid.15983. Background: One of the most important ways of pathologic and non-pathologic parasites transmission is through eating raw vegetables. Iranian people believe that eating raw vegetables is an important way to get some essential vitamins and minerals. Objectives: According to the high prevalence of pathologic parasites and also exporting different vegetables to the other provinces such as Tehran, we conducted this study to evaluate the parasitic pollution of raw vegetables in Amol city. Materials and Methods: This is a descriptive and analytic study compromised of 200 samples from 10 different vegetables including spinach, garden cress, parsley, lettuce, peppermint, radish, green onion, basil, coriander and scallion. The samples were evaluated using timely-sediment method and then centrifuging concentrating. The obtained results were analyzed by SPSS software and χ 2/Fisher's Exact Test. Results: Results showed that 93 (46.5%) of all vegetables (collected from 20 regions) were contaminated with pathologic and non-pathologic parasites. Among these, spinach and coriander were the highest (17.2%) and the lowest (3.2%) contaminated samples, respectively. The isolated parasites were nematode larva 25.8%, Giardia cyst 22.5%, Entamoeba coli cyst 19.3%. However, the obtained results from 100 restaurants and kebab samples did not show any parasitic contamination. Conclusions: Given hygiene issues and health status of people, the prevalence of some parasitic contaminations is the biggest problems among vegetable consumers. Using organized and new methods for irrigating the agricultural fields, preventing animals to enter the vegetable’s farmlands and also improving people’s knowledge on proper washing of vegetables can be useful in decreasing parasites prevalence. In many countries, especially in developing countries, parasitic infections are one of the most important health and economic problems, health extension, development and struggle against these diseases are important parts of mass programming in these countries. Some of the parasitic infections that are transmitted through food, soil or water are still the most important health concerns even in developed countries (1). Eating raw vegetables is a way of parasite transmission to human and the determination of vegetables contaminants and disinfecting were the main concern of health and therapeutic organizations, for many years (2). During the past years, by using man-made fertilizer and now because of using animal fertilizer, vegetables are infected by pathologic organisms and if we do not wash properly, they can transmit the parasites and other microorganisms to the human, and they can be a potential source of expanding infection in parasites life cycle (3). Different studies in all over the world has been performed in this regard and the results showed that there are noticeable parasitic contamination in different areas (4-10). Parasitic contaminations were studied in different researches in our country and the results of such studies showed that parasitic prevalence is different in each region. In this respect, parasitic contamination in some areas of our country was about 13% and in some others was about 56% (11, 12). We performed this study to evaluate the parasitic pollution in Amol city, because there is different prevalence of vegetable contamination in different areas of our country, there is not any study about vegetables contamination in north area of our country, almost all of the people living in north of Iran are farming and many of them use animal fertilizer for their fields which can maintain the parasitic life cycle, there is high intake of vegetables among the people living in this area of the country. This study was performed in 2012 in Amol city, North Iran. For the first step, the space of farming fields was evaluated and then all were divided into twenty different geographical areas. Twenty samples (each contains 500 g) containing ten vegetables including spinach, garden cress, parsley, lettuce, peppermint, radish, green onion, basil, coriander and scallion were collected. Hence, overall 200 samples were collected. Each sample kept in container containing four liter water and eight grams of anionic detergent for eight hours to separating larva, ova, and the cysts of the parasites. After eight hours, vegetables have been removed from the bucket and washed by high-pressure water for three times to complete separating parasites and adding them to the content of each bucket. Each bucket were positioned in quiet place and maintained for 14 hours in laboratory to get complete sedimentation of parasitic materials. Then, top layer of the content sent out and the sedimentation content of each bucket were collected in one liter bottles. During investigation, sediments were divided in several centrifuging tubes and then they were centrifuged for five minutes at 1500 rpm. Four different slides were made by using physiological serum and logol solution and then evaluated microscopically at 10X. and 40X. For the final step, the resulting data were evaluated and analyzed by using descriptive statistical methods and SPSS software and χ 2/Fisher's Exact Test. There were pathologic and non-pathologic parasitic contaminations, in 93 cases (46.5%). The highest contamination was observed in spinach (16 cases, 17.2%) and the lowest amount of contamination was in coriander (3 cases, 3.2%). The contaminating agent in 47 cases was a uni-cellular and in 46 cases was a multi-cellular agent. In uni-cellular pathologic group, the highest prevalence was for Giardia cyst which had seen in 21 samples. In uni-cellular non-pathologic group, the highest prevalence was for Entamoeba coli which had seen in 18 samples. Entamoeba histolytica/dispar was an important pathologic Amoeba which was reported. The highest level of contamination was observed in fields which were near the small and large lakes. There were five cases of entritic coccidian’s oocytes which more of them were near villages and residency areas. Among multi-cellular group, nematode larva was the highest infective agent. Six Trichostrongyluidous eggs were the highest and two Hymenolepis nana eggs were the lowest contaminants among worm eggs. Other parasites in this study are shown in Table 1 and Figure 1. The results of the present study show that 46.5% of vegetables collected from Amol city lands were contaminated with parasites. The highest number was for Giardia cysts and soil-nematode larva. Moreover, there were different values of vegetable contaminations reported in other studies in other cities of Iran. Nazemi et al. showed that 38% of their samples, which were collected in Shahrood in 1390, were infected by parasites. Again, in that study, the highest prevalence was for Giardia cyst which is in accordance to the present study (13). Homayoni mentioned Giardia infection as a highest contaminant agent (14). According to the fields' irrigation, it is expected to see high contamination with these uni-cellular parasites. The second parasite, detected in this study, was Entamoeba coli compromised 19.3% of all parasites. These results are the same as the results of Nazemi et al. (13) and also Al-megrin et al. in Saudi Arabia (15). The isolation of this parasite does not have any pathologic importance, but it shows that vegetables are contaminated by human feces and it has a great importance (16). Entamoeba histolytica/dispar compromised 3.2% of all parasitic contaminations of this study and also Jiroft studies (17). In this study, most of the strains were non-pathologic dispar ones. But, in respect to limited parasitological methods to isolate Entamoeba dispar from Entamoeba histolytica and due to the probability of pathologic strain pollutions, contamination of eatable vegetables in Amol city is of great importance. Rabditoide larva compromised 12% of multi-cellular pollutions which is in accordance to the results of Dehghani et al. from Yazd (18). According to the clinical experiences in laboratories of Amol city, after Giardia, the high frequent parasitic agent is Strongyloides stercoralis. Although these parasites are in plants and free living, these results is of importance due to the probability of contamination with Strongyloides stercoralis and some pathologic nematodes. 6.4% of all contaminations were belonged to Trichostrongylus egg which is in accordance to the other studies in Esfahan and Yazd (11, 18). All of the farmers in north area of Iran are using animal fertilizer to improve the soil properties and their products. Field animals such as sheep (which are the main hosts of these parasites) live in this environment and this can result in human infections. For these reasons, it seems necessary to prevent animal entrance into the vegetables farm lands. In the current study, Dicrocoelium eggs compromised 4.3% of all worm eggs. This amount of contamination is reported in other cities of Iran such as Qazvin, Esfahan and Yazd (11, 16, 18). According to the high prevalence of this Termatoda in animals vs. humans, we can conclude this sort of contamination is due to animal fertilizers. This parasite is a zoonotic agent and in desired circumstances, it can cause problems for human health. While according to the transmission way of this parasite, it seems that vegetables are not good transmitting vectors of infections but they have an important role in parasitic life cycle. Taenia eggs were seen in about 3.2% cases of this study which is also reported in other studies at different prevalence (13, 16). Because of vegetable contamination by Taenia eggs, the human infection and Hydatidosis in this way is probable. Therefore, vegetable wash before intake is very important to prevent human infections. Fasciola hepatica eggs were seen in about 4.3% cases which is also reported by Malakoutian et al. in Kerman (17). Although this is an animal disease and is mostly reported in animals such as sheep, but it can cause pseudo-diseases (spurious infection) and complications in humans. The presence of these parasites and other organisms in animals is due to not using fences to prevent entrance of animals. Another parasite is Toxocara egg which is detected in 3.2% of cases. In a study by Uga et al. the presence of this egg was confirmed in Vietnam (8). Toxocara infection in humans, especially children resulted in ophthalmologic complications including retinal inflammation and ulcer and finally blindness. 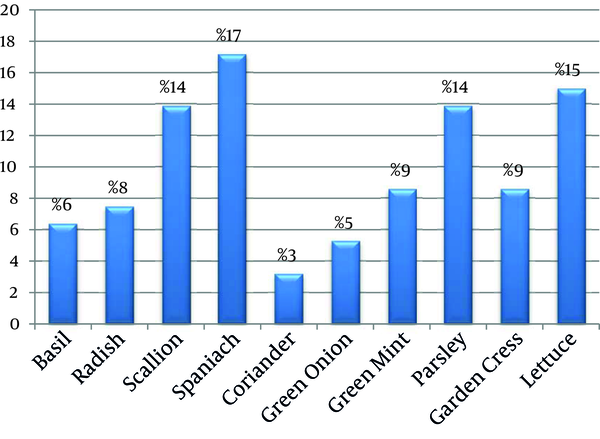 In our study, the lowest prevalence was for coriander contamination which is corresponded with Shahnazi et al. (16). In addition, in a study in Qazvin, the same results were obtained. One reason for this low contamination rate of coriander is the shape of this plant which has not too many layers and also has thin leaves. According to the high amount of parasitic contamination in vegetables, we can prevent human infections by educating people to wash and disinfect vegetables properly. Implication for health policy/practice/research/medical education: Consuming vegetables among Iranian people could be taken into consideration from the viewpoint of parasitic contaminations which have impact on public health and socioeconomic. Authors’ Contribution: Concept (a), design (b), definition of intellectual content (c), literature search (d), microscopic observation (e), sample collection (f), data analysis (g), statistical analysis (h), manuscript preparation (i), manuscript edition (j). Abolghasem Siyadatpanah: b, d, e, i; Fatemeh Tabatabaei: c; Amir Emami Zeydi: b, f, l; Adel Spotin: h, j; Mehrdad Assadi: e, d; Sepideh Moradi: d; Ali Rostami: d; Vahid Fallah Omrani: a, h, i, j; Fatemeh Memari: d; Fateme Hajialiani: d.
Financial Disclosure: The authors have no proprietary interest in any aspect. Funding/Support: This research was supported by a grant from Department of Nursing, Faculty of Nursing and Midwifery, Mazandaran University of Medical Sciences, Amol, Iran.